Christopher will soon begin an adventure as he reports to the Universal Technical Institute at six-thirty Monday morning. He’s undertaking the Toyota Professional Automotive Technician program, and, hopefully, after sixty weeks, he’ll be on his way to into business of automotive maintenance and repair. Categories: Christopher, Family, General Discourse | Permalink. I was happy to hear the Sean got out on the Truckee River last week during his visit to a cabin on Tahoe’s north shore. 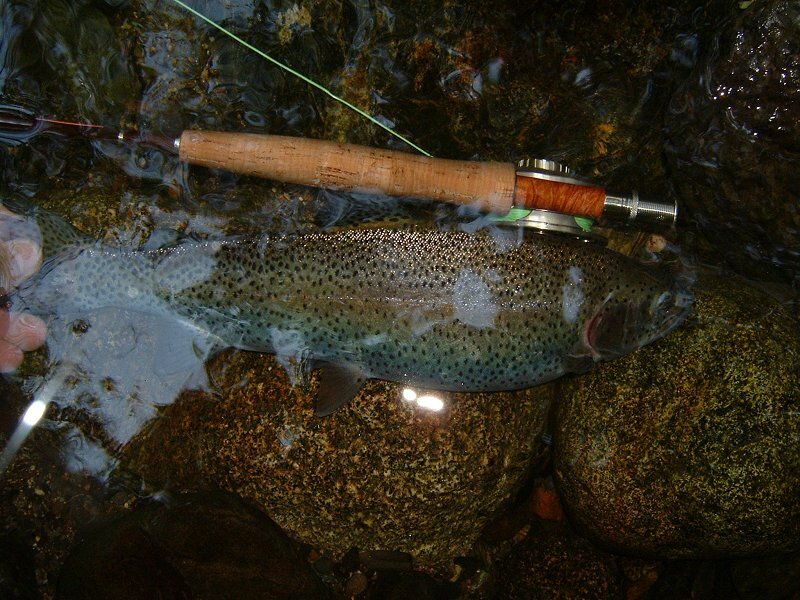 Categories: Fly Fishing, Sean, Sierra Nevada | Permalink. Lower water on the Tuolumne River. 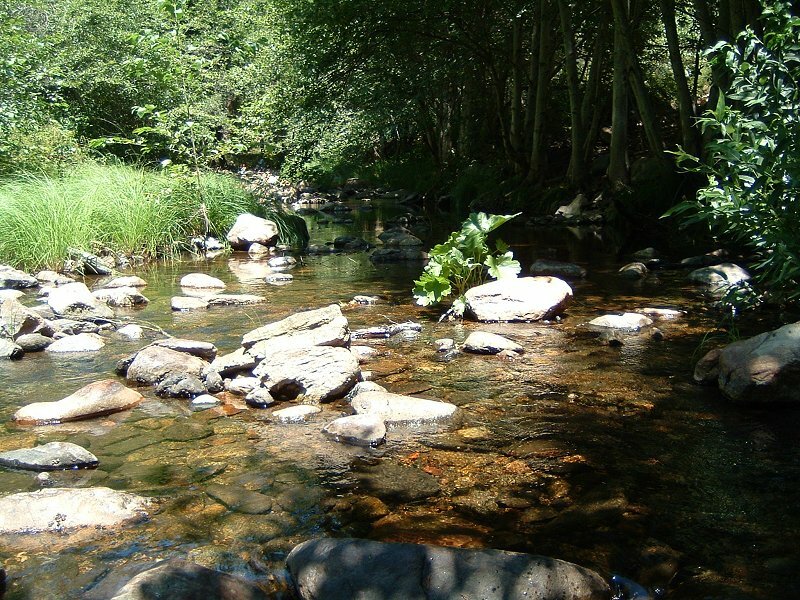 Finished washing some Sierra Nevada foothill mud and gravel off my wading boots and already I’m looking forward to the next visit to the cabin. (Increasingly one of the few “true” cabins in Twain Harte, it seems.) I took a day off to squeeze a bit o’ fishing in last weekend. Headed up Thursday evening to allow for two full days of fishing and by seven o’clock Friday morning I was casting on the skinny water of the Lower Tuolumne River’s North Fork, near Basin Creek. This is the same section of the Tuolumne I enjoyed fishing back in May. What a difference 10 weeks can make! Low water concentrated the remaining fish in a few pools and small runs, and campers building rock dams limited me to fewer locations. And, of course, I would have to cast under overhanging branches or to the far side of boulders to reach the best feeding lanes. But I did reach those feeding lanes. After a painfully drawn-out slow start, I had the first rainbow to hand about thirty minutes after my arrival. Surprisingly, this decent-sized trout rose about four feet from the bottom of a deep pool to nail my dry fly. After I pulled this fish to the side for a quick release, three young boys each cast a spinner to the very spot where I hooked my fish. So upstream I went. Unfortunately, after about an hour of hiking, I didn’t find too much suitable water. Returning to some of the downstream waters I enjoyed the challenge of presenting a dry fly (with a nymph dropper) well enough to encourage a strike. I did well enough to put about nine fish in the net, but because I was using a size 20 bead-head nymph (and perhaps because I was late in setting the hook), about as many fish were granted a long-distance release. It was a good day, capped off by a visit to Diamondback Grill, a favorite family hamburger joint. Saturday was a lucky day for me. I was at Moccasin Creek about six-thirty that morning, only to find that my fly box was not in my vest pocket! After searching my car and racking my brain, I resigned myself to the will o’ the winds. It was only a thirty-minute drive from Moccasin Creek to the Tuolumne, where I had fished the previous day. I scanned the ground where I had parked the car and, with my waders on, began to retrace my steps. Surprised inadequately describes how I felt when, only two minutes later, I found my fly box resting on some moss on top of a rock. The day was saved. I headed back to Moccasin Creek. I was finally on the water by nine o’clock. Which meant that most of the prime spots were being flogged by hardware or bait fishermen. But with a bit of testing I found another nice feeding lane that terminated near a tree-shaded tailout. Sure enough, fish were there. I don’t think more than thirty minutes went by without my landing a rainbow or brook trout. As the day progressed and lesser other fishermen left for lunch, I had much of this stretch of the creek to myself. One of the highlights was a beefy rainbow of about fifteen inches. The other was a big fish…one that nailed my nymph, flashed a broad side near the surface, then headed deep and stayed deep. It was bendo time with the ol’ fly rod. But I was using size 20 fly and this fish was able to spit it out. The afternoon presented the challenge of changing tactics…and I ended up landing fish on dry and wet flies as well as nymphs. Even some flies I tied myself. Best of all, most everything except fishing was banished my thoughts for those two days. Ah, suggestion for a fly pattern. Best wishes to everyone for happy and safe Fourth of July. Unfortunately, here in California we have plenty o’ natural fireworks going off – though not all naturally caused – with 1,781 fires and 505,872 acres burned since June 20, 2008. Here’s hoping that the services of the 20,254 committed personnel, 1,503 fire engines, 571 hand crews, 340 bulldozers, 482 water tenders and 119 helicopters soon won’t be needed!